Remember the red sports car from Part 1? There is a lot more happening underneath that red paint. If you want to go fast around the track, you better have good tires, a well-tuned suspension and a dialed-in motor. If not, you may not even make it around the track at all, or you may crash into the wall. Not unlike your car, not having a good process for your color management can leave you tweaking colors or reprinting jobs. Having a process to follow is critical for consistent and repeatable color, and using the color management pyramid as the basis is easily introduced into your production environment. An important point to note is the importance of documenting what you are doing. Don't try to remember what the humidity level was four months ago, or what rendering intent you use for a particular customer and their jobs. Have a notebook or spreadsheet for each device with notes on the settings and environmental conditions so that you are able to track each step of the pyramid. That said, let's jump right into the first level of the pyramid. The first level, Ambient or Environmental Conditions, refers to the actual physical environment where the printer resides. It's important to know the humidity and temperature levels, and the quality of the electrical source you are using. Does the printer or media suffer from static electricity (probably at its worst in the dry winter months)? Is the environment clean, or is the printer located near an outside door or near equipment that generates a lot of dust (think of cutting and routing as an example)? Using a decent quality hygrometer with a thermometer will help you in evaluating environmental conditions, but will do nothing to alleviate the situation. For that you will need to make sure the environment is temperature and humidity controlled as much as possible. The question always asked is what is the ideal humidity and temperature. Refer to the manufacturer's data sheets; however, keeping the temperature between 70-75 degrees F and humidity levels in the 40-60 percent range is a good practice. And don't forget to allow the substrates you are printing on to acclimate to your environment before loading on to the printer - most manufacturers will say 24 hours is a good practice. Lastly, all printers should be on some sort of surge protection. Use an amp meter to test your electricity source and make sure that it falls within the manufacturer's range. Many manufacturers will have recommendations if you are trying to incorporate a battery backup for your printer, so make sure you know the electrical draw the printer requires and purchase enough battery to allow for a controlled shutdown in the event of a power outage. Some impacts of a poor environmental condition will be noticed in ink absorption and droplet placement. Too high humidity and the ink may not dry as quickly, and too low humidity can contribute to nozzle clogging. High static electricity can actually cause ink droplets to veer off course and not fall where expected, which is an obvious problem for quality and color. And don't neglect proper storage and care of your media when considering environmental conditions. Roll materials should never be stored flat on a shelf as a flat spot will be created which will definitely impact print quality. Next up on the pyramid is calibrating the printer and the media. I typically start with a nozzle test to make sure that all the nozzles are firing and that there are no deflections - if there are problems, resolve it here before going any further. In many cases where I have been onsite with a customer trying to "solve" their color issues, I would run a nozzle test only to find that they were missing 20 percent of the nozzles (either through clogs or deflections). At this stage, the pyramid mentions heat settings, which is obviously a reference to solvent-based inks. But even if you are running a UV-cure device, it is important to make sure that everything is set for your production environment that you will be running before you go on to the next steps. After the nozzle check it's time to run a head alignment - the steps vary from printer to printer, so you'll need to do your research. Last in this step of the pyramid is media feed adjustment. This part of the step is going to apply primarily to those machines that move the media during the printing process. The manufacturer should have documentation on each of these steps and will have recommendations for cleaning intervals which should not be overlooked. Some of the impacts of improper calibration are noticed in ink drop placement (alignment) and fixation (heat or poor UV lamp settings). Prints may appear fuzzy or grainy, exhibit a poor dot pattern and/or banding. We have finished with the lower part of the pyramid - I like to refer to it as the base of the pyramid, because without it, you will not have a stable platform and will struggle with color issues before you even begin any profiling steps. Moving up, the next level of the pyramid is RIP and print settings. Let's start with halftone and dither settings. These options will vary significantly between RIP software, and what they do is generate patterns that are used to create the illusion of tones and colors that cannot be physically reproduced. A fast processing "dither" will lay the color dots in a pattern, and sometimes we are able to see the pattern effect. More random looking patterns (such as error diffusion) actually take much longer to process, but generally result in better print quality. A dither pattern is great for banners and lower quality prints because it offers faster processing time. Error diffusion, on the other hand, can require three to four times more processing than dither, but will typically result in a higher-quality product - and these are just two of the patterns that are available depending on your RIP software. Most RIP manufacturers will have default settings based on what they have decided works best with their software, printer and media configuration. That doesn't mean you shouldn't experiment with the different settings to see what works best for your application. This is a good point to reiterate the importance of note taking. As you experiment with the different settings, it will be crucial to have good notes so that you can recall what settings worked best for which application. I would highly recommend that you put together a "sample" or "test" print (if you don't want to create your own, many of the RIP manufacturers will have some quality test print that you could use). Ideally this control print will have a variety of images both vector and raster, and should reflect the type of work that you typically do in your shop. Have a series of spot colors (I would obviously focus on those that you run the most or that give you a challenge) and a gray ramp (neutral grays from 0 to 95 percent). You also should find a target patch set such as the IDEAlliance 12647-7 Control Wedge 2013, or make your own that you will measure to establish a standard. The goal with the patch set or wedge is to have something that you can use as a tool to verify that your printer is giving you consistent and repeatable color. If you want to see a suggestion, SGIA offers a control print that is used during color management workshops. Find it at https://www.sgia.org/resource/other/sgia-control-image. Most of the other settings at this stage are pretty self-explanatory: resolution (is it printing 600x600, 720x1440, etc. ), pass count (how many times does the print head go over an area - this is a good way to hide when a nozzle is missing), and overprint (basically used for backlit applications). Light Ink Transitions refers to where the light inks will end or taper off and the primary colors take over (light cyan and cyan, for example). I also like to set the rendering intent at this stage. This is something that can be changed later and not affect the profile itself. I set the rendering intent to see how it affects my color output throughout the later stages of the pyramid. A rendering intent is a way for the software to take colors that are out of the printer gamut and bring them into gamut. Typically relative colorimetric using black point compensation is the rendering intent most commonly used for printing in North America and Europe. Some of the impacts that are noticed are overall gamut, print speed (number of passes) and ink consumption. Watch out for fuzzy or a grainy appearance, poor dot pattern, banding and trouble hitting/matching colors. The next part of the pyramid will be defined by your particular RIP software, and as noted before, this is not a RIP training article and you will need to check with your manufacturer if you don't know where these settings are located, or if you have never done any profiling. Primary Ink Restrictions is where you first have the chance to define the outer limits of the printer gamut. Each ink channel can expense up to 100 percent of ink. In almost all cases, 100 percent is unnecessary and even if the substrate seems able to handle it, some ink restriction is necessary to allow for re-linearization. Remember, more ink does not equal better quality. These days, many of the RIP software use a spectrophotometer to suggest or even set ink limits. Inks have a tendency to increase in chroma (the purity or strength of a color) until they max out and start to hook, which can then create shift in hue (the gradation of color; for instance, red, yellow, green and blue are all different hues) and can actually reduce the chroma. Setting the ink limit too high can cause over-inking artifacts, heavier than necessary ink consumption and possible hue shifts as mentioned previously. On the other hand, dialing the ink limit back too far will definitely affect the gamut of the printer and can even contribute to banding issues. You want to use as much ink as you can without sacrificing quality or causing the color shift. If cyan starts to look blue then you know the ink limit is too high - again, the good news is that most of the RIP manufacturers now use spectral data to either set the ink limits or in the ink limiting process. Before moving on to the next step in the pyramid, let's take a short detour for those that do not have the resources (yet) to take the plunge into the world of spectrophotometers and creating their own profiles. 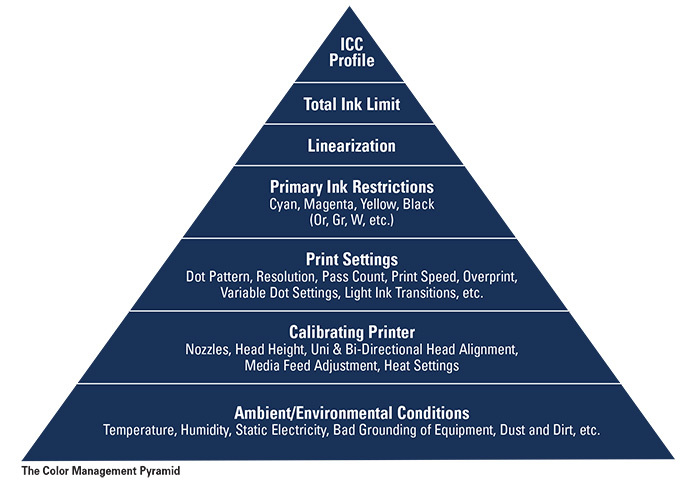 For those shops, it would be helpful to use the first three steps of the pyramid as the process that you will follow to make sure that your printer is printing as consistently as possible. After you have done that, print out a color chart, such as a Pantone® Coated chart from your design software. Now you have a reference - a manual chart that you can use to select colors when working on customer's files. Because you have printed the chart (and you should have one for banner and vinyl - and if you laminate, one with and one without lamination), you now have a physical representation that will let you know how your printer reproduces the color that you can see printed on the chart. This is not a perfect solution, but it is one that I have seen a number of shops use with success to help them with their color reproduction. The downside of this system is you will have to print these charts a few times a year to account for your printer's color shift that will occur over time, and particularly over different seasons; remember the summer high humidity and the winter low humidity. And this system is only good for those colors that you have printed with your chart. This isn't a perfect solution, but it can be a stop gap measure that you would use until you can acquire a spectrophotometer. We are nearing the top of the pyramid, and you should be noticing how each level builds on the levels before. Linearization is the next section. The goal of linearization is to distribute the printed tones evenly across the spectrum from 0-100 percent. When you run your first linearization in the profiling process, you are establishing a "basepoint" which will be a known and therefore repeatable state that the RIP can return to by re-linearizing if the printer's color has shifted. Earlier, you may have been thinking what options are available if you can't control the humidity in your print room. When you notice that the humidity has changed dramatically (say from summer and high humidity to winter and very low humidity), you could re-run the linearization, which will allow the printer to communicate with the RIP software to make the necessary adjustments to return to that earlier state. This is where the spectrophotometer is invaluable and irreplaceable. In the Primary Ink Restrictions level, we could manage without an X-rite i1 Pro or a Barbieri SpectroPad, but here, we must have a device to read the linearization chart to give the RIP the spectral data it needs to re-linearize. Linearization impacts gradient smoothness. If you have an uneven distribution of ink (pre-linearization) you will definitely see an improvement with a good linearization curve. Also affected are tonal detail, gray balance/neutrality and loss of shadow or highlight detail. We're almost to the top. The next level of the Color Management Pyramid is Total Ink Limit, sometimes referred to as TAC for Total Area Coverage. This step limits the maximum total ink that the RIP will send to the printer when mixing the primary inks (CMYK). Think about a rich black that could be 100-percent CMYK for a total of 400-percent ink, meaning a real possibility for a puddle of ink on the surface of the substrate. Total Ink Limit is always a visual assessment. The RIP software will have charts that are printed showing the different percentages of ink used, and the goal is to see how much ink the media or substrate can hold without introducing over-inking artifacts. The over-inking artifacts to look for are distorted patterns with ink bleeding along the media, blurred edges, ink pooling and bronzing where the color has a two-color or oily appearance. Total Ink Limits impact color gamut (though not as much as the Primary Ink Restriction step), gradient detail and quality, tonal detail and ink consumption. Some of the symptoms that will alert you to this are over-inking artifacts, loss of shadow or detail in highlights and inconsistent color. The same adage applies here as it did in Primary Ink Restriction - more ink does not equal better quality. This would be a good time to print your sample or test image to look for any of these issues before moving on to the next step. And we're at the top of the pyramid - the all-important ICC profile. So often print operators talk about the profile as if it's all that matters, and while it's at the top of the pyramid, it only works if the base has been well constructed. Take note that the ICC Profile is a snapshot in time of each of the steps we've covered to get here, so using a "canned" profile (one provided by a manufacturer) is really using the snapshot from the printer they used to create it, and the environment where they were when it was created. If you are going to use a canned profile, it would be a good idea to re-linearize so that you will have a place to return to when your printer's color shifts. The actual profile you will build at this point is created by printing a range of various color patches. In this case, more patches do equal better quality. Most RIP software will give you options for number of patches. Though it takes a little more time, more patches will give you more even color and thus will give you better quality. Once you've printed the patches, it is time to take a spectral measurement. I like to imagine the profile as a three-dimensional space of a fixed size with color/data information. The more patches you read, the more data points and the less extrapolation that needs to be done from this three-dimensional space to match a particular targeted color. The last step in creating the profile is GCR (Gray Component Replacement) or UCR (Under Color Removal). Suffice it to say that the goal is to tell the RIP where to start black replacement in component color areas (CMY+K). If you have a printer that prints very small, fine dots, then you can start the black ink earlier - and therefore use less CMY which will save you in ink consumption. This is another great use for your sample image. Try starting the black ink earlier and earlier until you begin to see peppering, particularly in the highlights such as skin tones. Once you see that, you will know to back the black ink off a little, and you should have a good setting. Most RIP software will have a recommendation, but don't be afraid to experiment. The ICC profile (along with GCR) impacts color accuracy, gray balance/neutrality and ink consumption. Some of the symptoms that will alert you to a problem are heavy ink consumption, particularly dependent upon the GCR setting, and metamerism, a color shift caused by different lighting conditions. Using more black in the neutral colors will help to minimize the effect of metamerism. Now you have it - the complete Color Management Pyramid. Remember that without a solid foundation, you can't build a good profile. Following these steps will send you down the road to more consistent and repeatable color. Stay tuned for Part 4 of this series where we'll explore RGB versus CMYK workflows, setting up your Adobe software and monitor profiling and soft proofing. Ray Weiss, Digital Imaging Specialist for SGIA, joined the Association in 2014. He provides solutions and technical information on digital printing as well as digital equipment, materials, and vendor referrals. He oversees several workshops at SGIA along with the association's digital equipment evaluation program. His 25+ year career in the graphics industry began with a typesetting and prepress business in Washington, DC, which grew into an offset print operation in Maryland. He then moved into wide format sales, training, support, and service. Ray has extensive experience in color management and worked closely with the Smithsonian Institution to implement a color managed workflow in their Exhibits department. This article appeared in the SGIA Journal, July / August 2016 Issue and is reprinted with permission. Copyright 2017 Specialty Graphic Imaging Association (www.sgia.org). All Rights Reserved.